Plants perennial; cespitose, sometimes shortly rhizomatous. Culms 7-130 cm, erect. Sheaths open to the base, with tufts of hairs at the auricle position, sometimes with a line of hairs around the collar; auricles absent; ligules of hairs; blades rolled in the bud, flat or involute when dry. Inflorescences terminal; panicles, racemes, or a solitary spikelet, to 12 cm; rachises, branches, and pedicels scabrous or hirsute. Spikelets terete or laterally compressed, with 3-12 florets, terminal floret reduced; disarticulation beneath the florets, also at the cauline nodes in some species. 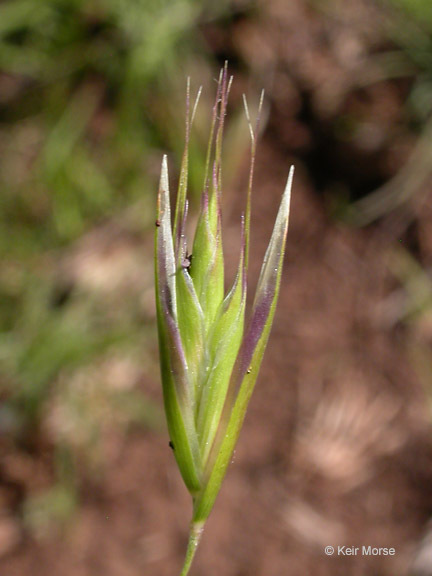 Glumes subequal or the lower glumes a little longer than the upper glumes, usually exceeding the florets (excluding the awns and lemma teeth), lanceolate, chartaceous, 1-7-veined, keels glabrous or sparsely scabrous; rachillas glabrous; calluses densely strigose on the sides; lemma bodies obscurely (5)7-11-veined, backs glabrous or pilose, margins usually densely pilose proximally, apices with 2 acute to aristate lobes, mucronate or awned between the lobes; awns, when present, geniculate and twisted below the geniculation; paleas about as long as the lemma bodies, 2-veined, veins scabrous, apices obtuse, sometimes bifid; lodicules 2, glabrous or with a few hairs; anthers 3, their size depending on whether the florets are chasmogamous or cleistogamous; ovaries glabrous. Caryopses 1.5-5.5 mm, ovate to obovate, dorsally flattened, brown; hila linear, 1/3-3/4 as long as the caryopses. Cleistogenes usually present in the lower sheaths, with 1(-10) florets, not disarticulating; rachilla internodes about as long as or longer than the adjacent florets; lemmas coriaceous, glabrous or scabrous near the apex, entire, unawned; paleas sometimes slightly longer than the lemmas; anthers 3, minute; ovaries glabrous; caryopses more linear than in the aerial florets. x = 12. Named for the French botanist Étienne Danthoine, who worked in the early nineteenth century.